Once upon a time, in a far far away Asian continent, in a place only known to us as Istana Kuala Lumpur, lives the Malaysian King and Queen. 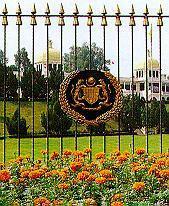 Their residence is also known as the Istana Negara, National Palace or Royal Palace of Malaysia to the locals. I won't tell of the romantic story of how they met but you have to be of the royal blood to be able to be King. There are 13 States in Malaysia out of which 9 States have their own Sultan. They each take a turn to be King for a period of 5 years. The appointed Sultan will leave their State and reside in the Istana Kuala Lumpur to be the King. After this period of 5 years, it will be another 40 years before the Sultan from the same state has the honor to be King again. So ladies, the last I checked, there are still some single and available Sultan's sons out there! Make your fairy tale come true! 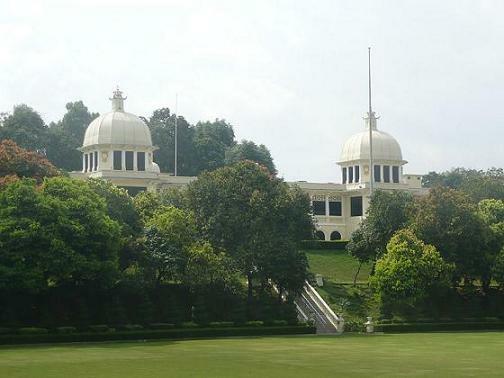 Istana Kuala Lumpur, the official residence of the Yang di-Pertuan Agong, is a double-storey mansion originally built in 1928 by Chinese millionaire, Chan Wing. Believe it or not, rumor has it, the key reason for having such a huge mansion was to house his 26 wives! It stands on a 11 hectare piece of land on the slope of a hill overlooking the Klang River in Kuala Lumpur along Jalan Syed Putra. After the Japanese occupation in World War II, it became the residence of the Sultan of Selangor. The Federal Government converted it into the official residence of the King at 1957. Architect E.K. Dinsdale supervised and conducted major renovations. In 1980 extensions to the palace, including a new main throne room with a seven-tiered throne, were completed in less than seven months, by the Public Works Department under Senior Architect, Capt. David Wee. 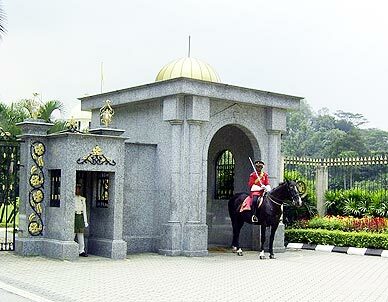 The Istana Kuala Lumpur is not only meant for tourist attraction, but has several functions as well. The extremely long driveway, lined with cypresses and casuarinas, leads to the two entrances to the West and East Wings. The Balairong Seri (Throne Hall) is located in the East Wing. The hall is used for official and customary functions like the installation ceremony of a new King, investiture ceremonies and the taking of ministerial oaths. It was in 1980 where the Installation Ceremony of His Majesty Seri Paduka Baginda Yang di-Pertuan Agong was first held at the Istana Kuala Lumpur after the major renovations. Presentations and acceptance of diplomatic appointments are also held here and at other times it serves as a banquet hall. Prior to this the Installation Ceremonies were held at the Tunku Abdul Rahman Hall in Jalan Ampang, Kuala Lumpur. In another function hall - Dewan Mengadap (Audience Hall), the King receives Heads of States and Foreign Dignitaries. During the Conference of Rulers, this hall serves as a resting place for Sultans and Governors. Other major rooms include the Bilik Duta (Ambassador's Room), Bilik Permaisuri (Princess's Room) , Bilik Menteri(Minister's Room), and Bilik Mesyuarat Raja Raja (Kings Meeting Room). When are these utilized? The King receives his honored guests and Prime Minister in the Bilik Duta. Let's not forget our lovely Queen! She receives her guests in the Bilik Permaisuri of course! The Bilik Menteri is meant for their guests as a rest room. Finally, the Bilik Mesyuarat Raja Raja is for? Yes - meetings for the Conference of Rulers which is situated in the West Wing. Boy oh boy! All those meetings! Do they spend time unwinding, relaxing, or have fun like us commoners? Of course they do! They are only human right? There is a six-hole golf course, swimming pool, tennis courts, badminton hall, gymnasium and a lake in the royal grounds of the palace. There is also a guard house for the household troops. Other facilities include a medical and dental clinic, police station and government quarters located behind the palace. The entire ground is gated elegantly and the Royal Crest of His Majesty placed on each steel bar between two pillars of the fence can be easily spotted. The main entrance of the Palace lies a majestic gate formed like a beautiful arch. On each side of the arch, not to be missed are two guard posts shelter. Why not to be missed? Well, clad in their Malay costume and British uniform mostly mistaken like the ones in the Buckingham Palace stands tall two handsome guards. They could be sometimes seen mounting their horses, bravely holding to their riffles/swords. The changing of the guards can be witnessed hourly from 08:00 to 16:00 on weekdays. How to get there : The most convenient mode of transportation it to take a taxi from the KL Sentral Station. Updates - A new RM400mil palace complex will be built in Jalan Duta to replace the Istana Kuala Lumpur. The new Istana Negara, to be built on a 96.52ha site atop a hill on Jalan Duta, is scheduled for completion in 2009. The new Istana Negara will be steeped in Islamic and Malay architectural designs. The fate of the present Istana Negara would be determined by the Prime Ministers Department. It is learnt it had been proposed as a royal museum.